Originating in Spain, this flock-guarding breed was developed to protect sheep from such predators as wolves and bears. The Pyrenean Mastiff nearly became extinct during the 1930s, but has slowly been revitalized. They are considered to be a rare breed and are difficult to obtain. A breed of formidable size and strength, the Pyrenean Mastiff is alert and agile. They possess a noble demeanor, firm bone structure, and are muscular. However, they are not heavy or sluggish and have been noted as having a "clear concept of their strength". Pyrenean Mastiff's are a breed of many talents and abilities. The Pyrenean Mastiff is fearless when protecting and defending their family and property. They are affectionate, gentle, and reliable. Pyrenean Mastiff's will get along with dogs and other household pets they have been raised with. Small children should not be left unsupervised due to the possibility of being toppled over by this gentle giant. This is not a threatening breed, but will not hesitate to take action if they perceive a threat. RPyrenean Mastiff's require regular brushing. Bathing should be done when necessary. It is important to routinely check the nails, teeth, and ears. This breed is prone to such health issues as eye problems, inflammatory bowel disease, hip dysplasia, and bloat. 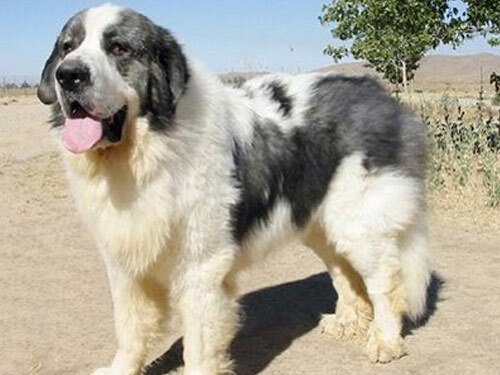 The coat of the Pyrenean Mastiff is thick and dense. It lies close to the body and is longer at the shoulder, neck, stomach, and behind the legs. The Pyrenean Mastiff is extremely intelligent and relies on signals and commands from it's master to perform it's duties. They are eager to please and basic obedience is recommended. They will not respond to harsh or heavy-handed methods. Training must be done with firmness, fairness, patience, and consistency. The Pyrenean Mastiff breed is not recommended for city or apartment dwelling. They require a rural setting with ample space to roam and run. They Pyrenean Mastiff thrives on having a job to do.